However, even though the tool is feature-rich on its own, it's still possible to get even more from Google Docs by going beyond its handy built-in features and using some third-party add-ons. 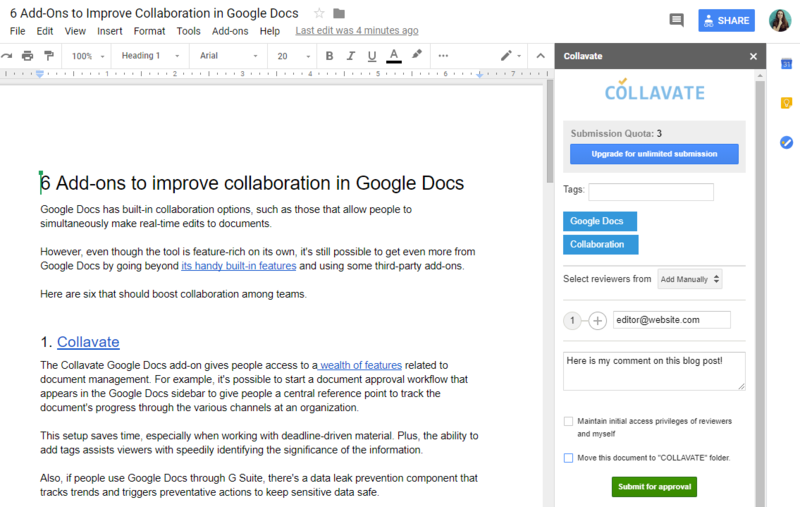 The Collavate Google Docs add-on gives people access to a wealth of features related to document management. For example, it's possible to start a document approval workflow that appears in the Google Docs sidebar to give people a central reference point to track the document's progress through the various channels at an organization. This setup saves time, especially when working with deadline-driven material. Plus, the ability to add tags assists viewers with speedily identifying the significance of the information. Also, if people use Google Docs through G Suite, there's a data leak prevention component that tracks trends and triggers preventative actions to keep sensitive data safe. Collaborating becomes a bit more difficult when you're working on a group document that contains particular portions only certain people should see. For example, if the shared content has client information that's not appropriate to share between departments or has plans that need to stay between executives, it may seem that the only solution is to make a separate document without those details. Fortunately, DocSecrets offers a more straightforward solution. It allows hiding and encrypting secret sections of a document, making them accessible only to people who know the password. The concealed material then appears in a sidebar once individuals enter the correct password, but the content disappears after prolonged inactivity. DocSecrets passwords never get sent to Google's servers. 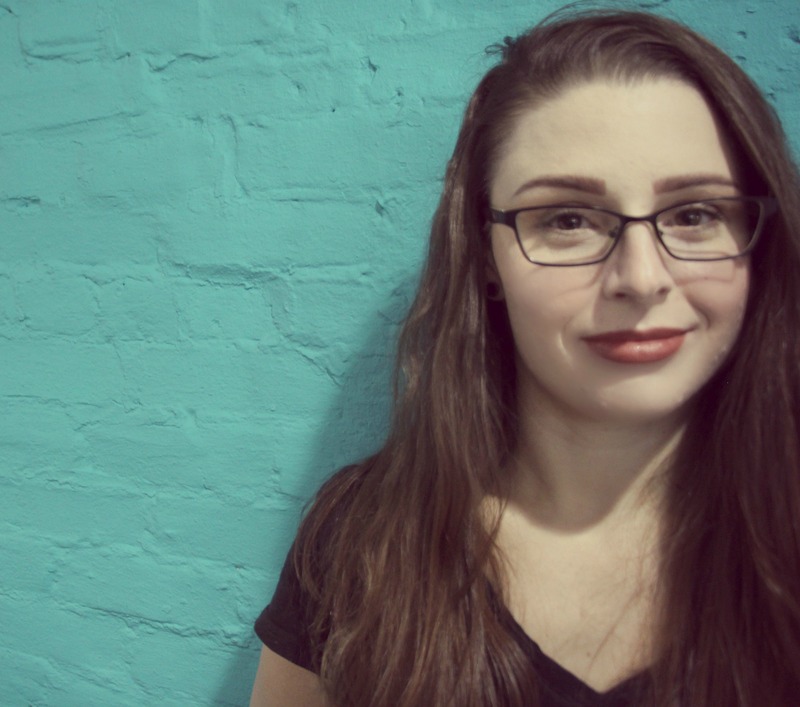 Although that could cause some headaches if an entire team forgets a password, it also means that collaborators don't have to worry about passwords getting compromised due to external data breaches. This add-on works well when people frequently collaborate on documents that contain a substantial number of links, such as company wikis. It allows people to choose links, files or folders from Google Docs and insert them into the current content without typing anything. Concerning a link, it appears as part of the selected text in a document. 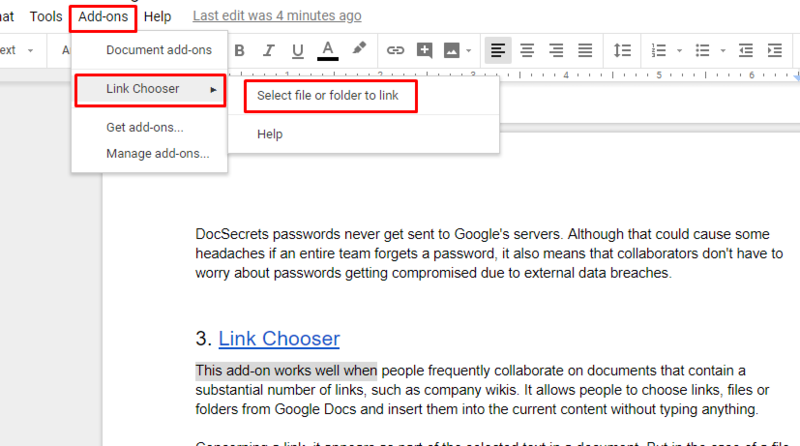 But in the case of a file or folder from Google Docs, the title of that content shows as the linked portion. This tool makes link insertion more efficient than it may be otherwise, mainly because it doesn't require leaving the Google Docs content that's in progress to search for links. The choosing process happens in a pop-up box. Google Docs recently expanded its offerings with a drawing feature to help you get more out of the service. It allows users to draw simple diagrams, but since it's limited in scope, people who use diagrams frequently in collaborative work will likely need a more powerful tool. 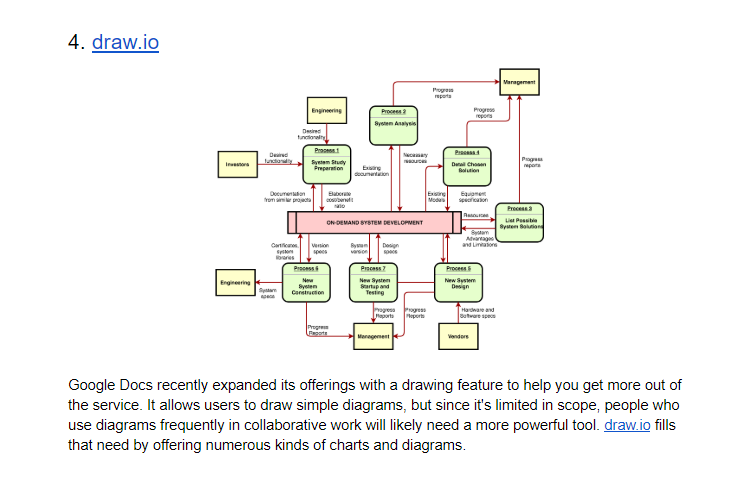 draw.io fills that need by offering numerous kinds of charts and diagrams. People can choose a diagram template, ranging from a Venn diagram to a flowchart, then watch as it instantly appears in the Google Docs content on the screen, ready for tweaking as desired. Each diagram has a sidebar for making specific edits. However, people can also drag elements around on the screen when working with the charts. It's important to know that collaborative editing is turned off by default with this tool. An early December 2018 update mentions needing to activate the Synchronize button within the draw.io interface to merge the changes that people make instead of discarding them. No matter the size of a company or the kind of business it handles, it's likely impacted by the fact that report creation has become part of the daily duties for many people around the world. Supermetrics allows for importing business metrics from various sources, such as Google Analytics and Facebook. There's also an automatic daily refresh feature that ensures all people who are looking at the data see the most current statistics. In addition to incorporating the native sharing features in Google Docs, Supermetrics also has an email scheduling component that facilitates the sending of new reports out to all collaborators or others who should see the material. In today's increasingly paperless society, it's still crucial to get legally binding signatures on documents such as tax forms or employment contracts. 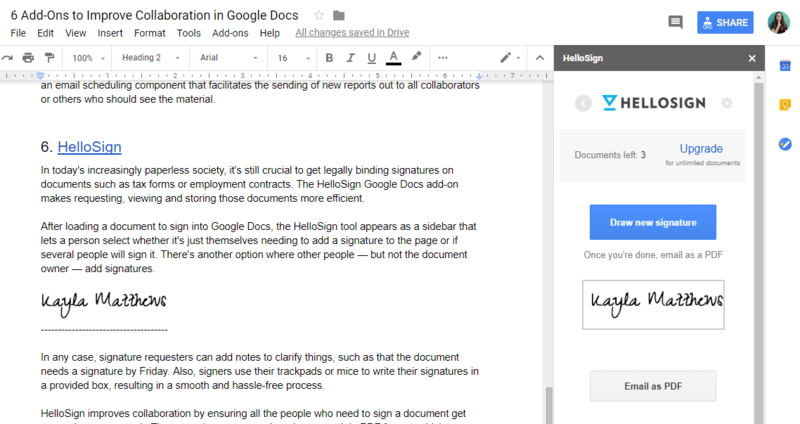 The HelloSign Google Docs add-on makes requesting, viewing and storing those documents more efficient. After loading a document to sign into Google Docs, the HelloSign tool appears as a sidebar that lets a person select whether it's just themselves needing to add a signature to the page or if several people will sign it. There's another option where other people — but not the document owner — add signatures. In any case, signature requesters can add notes to clarify things, such as that the document needs a signature by Friday. Also, signers use their trackpads or mice to write their signatures in a provided box, resulting in a smooth and hassle-free process. HelloSign improves collaboration by ensuring all the people who need to sign a document get convenient access to it. Then, people can export signed paperwork in PDF format, which means the traditional process of printing papers, adding a mark of agreement and putting them into filing cabinets is no longer necessary. Some of the benefits of going paperless include reducing clutter at the office and having information readily accessible on computers and stored in the cloud. The HelloSign add-on allows people to enjoy these perks while getting signatures for the documents that need them. You can see how all these tools work without you paying anything. However, some of them offer more features for people who pay for premium plans. Whether people want to increase the capabilities of Google Docs for free or are open to paying for extras, this list offers an excellent starting point for expanding the features of Google Docs, especially for working with others.